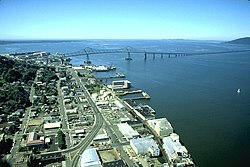 Astoria-Megler Bridge is North America's longest continuous truss bridge. A continuous truss bridge is a truss bridge which extends without hinges or joints across three or more supports. A continuous truss bridge may use less material than a series of simple trusses because a continuous truss distributes live loads across all the spans; in a series of simple trusses, each truss must be capable of supporting the entire load. Although some continuous truss bridges resemble cantilever bridges and may be constructed using cantilever techniques, there are important differences between the two forms. Cantilever bridges need not connect rigidly mid-span, as the cantilever arms are self-supporting. Although some cantilever bridges appear continuous due to decorative trusswork at the joints, these bridges will remain standing if the connections between the cantilevers are broken, or if the suspended span (if any) is removed. Conversely, continuous truss bridges rely on rigid truss connections throughout the structure for stability. Severing a continuous truss mid-span endangers the structure. However, continuous truss bridges do not experience the tipping forces that a cantilever bridge must resist, because the main span of a continuous truss bridge is supported at both ends. It is possible to convert a series of simple truss spans into a continuous truss. For example, the northern approach to the Golden Gate Bridge was originally constructed as a series of five simple truss spans. In 2001, a seismic retrofit project connected the five spans into a single continuous truss bridge. The Hart Bridge is a continuous, cantilevered truss bridge with an unusual design that includes a suspended road deck on the 332-metre (1,088 ft) main span and a through truss deck on the adjacent approach spans. This page was last edited on 12 August 2017, at 16:27 (UTC).